Home > Facts & Figures > Is Your Child Obese? Everyone is talking about child obesity – every day there are news reports about the obesity epidemic. A survey in the UK suggested that 25% boys and 33% of girls aged between two and 19 years were overweight or obese. Why Are Children Getting Fatter? It’s complicated! Different people blame different things – genetics, viruses, mother’s weight before and during pregnancy, the increase in availability (and the drop in price) of fast food and sweetened fizzy drinks, the size of portions, the loss of playing fields, the fear of letting children play outside, the rise in computer games and Internet social networking, the increase in alcohol consumption in children, peer pressure against exercise (especially in girls), the lack of breastfeeding (breastfed babies are less likely to become obese children) and the increase in obesity in adults, so a lack of role models in healthy eating. It probably is a bit of everything. It is a serious issue – obesity in childhood can have major impacts on health as children. 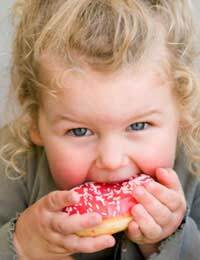 Obese children are more likely to develop type II diabetes and high blood pressure, and have high cholesterol. Obesity can also affect breathing – asthma might become worse, and obese children can develop sleep apnoea, where they snore heavily stop breathing briefly during the night – this can make them more tired during the day. They can also develop serious problems with their liver, gallbladder or pancreas. There are also the psychological aspects – obese children may have poor self-image and be bullied. Obese children have a risk of becoming obese adults, and all these health problems may continue, along with an increase in risk of cancer and osteoarthritis, potentially leading to disability and a shortened lifespan. Parents and doctors can use the body mass index (BMI), a figure calculated from height and weight, to show whether a child’s weight is underweight or healthy, or whether they are overweight or obese. However, because a child’s BMI is also dependent on their age (and is often referred to as BMI-for-age), it’s not quite as simple as working it out for an adult. The BMI needs to be calculated and then compared with percentile lines on a chart, but there are calculators and charts on the Internet to help out the calculations. An underweight child is counted as one whose weight is below the fifth percentile line (this means their weight is in the bottom 5% of children). A child with a healthy weight has a BMI between the fifth percentile and the 84th percentile. An overweight child’s BMI is from the 85th to the 95th percentile, and an obese child’s BMI is on the 95th percentile or above (the child is heaver than 95% of children). Children learn a lot from just watching their parents, and a parent’s healthy diet and lifestyle can have a major influence on his or her child. Parents can encourage healthy eating by improving the diet of the whole family, and can also encourage children to be more active, for example walking or cycling to school or the shops with them rather than going by car.